We offer high quality, full colour poster printing in London at competitive prices to suit any budget, and with a fast turnaround. Our poster printing services cover both standard - value-for-money and premium finish, with a wide choice of matte, satin or gloss papers. We can even laminate your poster paper to offer long term protection against fading caused by UV light. Our large colour printer produces high quality images at standard sizes A2, A1, A0, bespoke sizes up to 2m wide, and in almost any length you need. This means that if you need to print bus-sides or building wraps, we can handle it without any fuss. Foldable fabric posters are an excellent alternative to paper and an ideal solution for travel. Have your poster or presentation printed onto foldable canvas material and packaged in a tube, keeping it protected and easily packed away into a small bag or suitcase. Banners are the ideal solution for showcasing your work, business or services at exhibitions, conferences or even student events. Our banners are digitally printed in Central London and can be made to virtually any size you require, at a price that suits your budget. 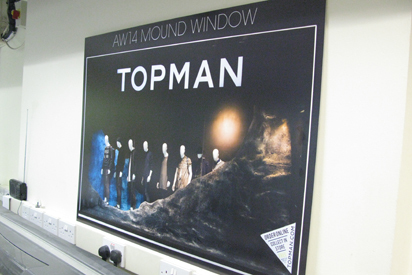 We can mount your posters to virtually any size using 3mm or 5mm Foamex board. 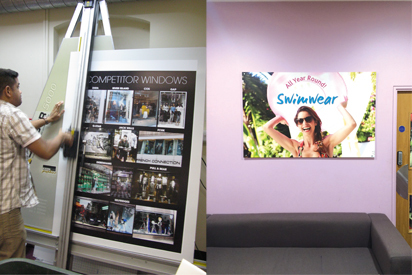 Ideal for exhibitions and presentations, these rigid mounted poster boards can also be print surface laminated. They’re light enough to carry around and easy to display on walls or exhibition stands with velcro. 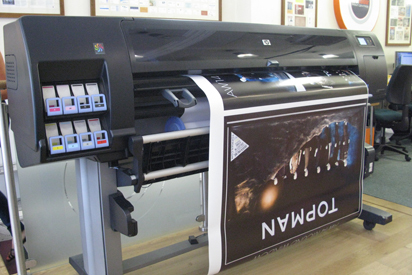 Our Central London location and digital printing machines, mean that we’re able to offer same day poster printing and banner printing services. Collect your poster or banner from our convenient shop location, or opt for same day delivery to any London address - including your home, business or even a hotel. Our talented team of installers can provide a full site survey for any project large or small, advising on best use of space and most appropriate materials for the job. Our pricing is always competitive, and our experienced team are on hand to help you find the most cost effective solution for your poster and banner printing needs. Want to request a quote? Can't find what you need? Please call us on 0207 636 2571 or contact us to find out more!